flossie's world: Just Another Studio Cuddle Day. And every day will be, Flossie. For those of you who don't already know, Flossie is 17 years old and has been in kidney failure for the past 5 years. During that time she's had mostly good days, but we always knew the time would come - when her little old kidneys would just be . . . done. And we also knew that it would break our hearts. Results from blood-work done this morning has done just that. It's with a broken heart that I'm sharing this news with you. Our only focus now is to keep her happy and comfortable. Every day is Cuddle Day. Every minute is Cuddle Minute. Soaking in every second. Flossie has always been very good at telling us exactly what she wants and needs - we're sort of counting on that more than ever right now. Thanks so much for all the kind words since yesterday's post. 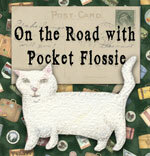 Please continue to keep Flossie in your good thoughts. We'll try to continue to keep you posted, here or on Facebook. In between cuddles, that is.